Hip In Detroit: Talking with James Brown About the Citizen Smile Release Show! Talking with James Brown About the Citizen Smile Release Show! Citizen Smile will be releasing their first full length since 2009 this Friday, November 22nd at The Loving Touch alongside two bands we love, Haunted House and The ILL Itches. The new album is called Everything’s Changing and Nothing, a fitting title once you read what guitarist and vocalist James Brown has to say about the new music. This promises to be a great show with a very solid lineup, so we wanted a chance to talk to Brown about the release and what the future holds next for the band. Hip In Detroit- How would you describe your music to someone who's never heard you before? James Brown- "We like to play our guitars really loud and we tend to wear our hearts on our sleeves, but at the end of the day, I’m pretty sure that it’s pop rock. Some of our biggest influences are probably Nada Surf and Tokyo Police Club (but there are a million others)." Hip In Detroit- It has been over three years since years since you put out your last full length. Why did you wait so long to put out this album? James Brown- "Basically, we didn’t feel any rush and we wanted to get it right. We worked really hard on making this feel like a full album and not just a collection of songs, and we wanted to let the songs evolve in practice and, for some of them, live. On our last EP, Ricky was pretty new with us on bass, and shortly after the release, Will joined on drums, so we kind of wanted to make sure that we knew who we were as a band before we jumped the gun and released anything." Hip In Detroit- How do you think you have changed as a band over the last three years? Do you think these changes are reflected in the new album ? James Brown- "I think that we’ve learned to write and play collectively as a band over the last three years. Nobody’s just playing their individual part to a song—we’ve all kind of learned where everything fits. Not to mention, we’ve all gone through tremendous personal changes that are reflected in the album." Hip In Detroit- Where was the new album recorded? Who was it recorded with? Who mixed it? James Brown- "It was recorded at Mixed Signals Studio in Waterford with Ryan Thomas, who also did the mixing and mastering." Hip In Detroit- What is your favorite track off the new album and why? James Brown- "Probably “People I’ve Done Wrong.” I wrote this song as a full-fledged folk song and brought it to the band; we tried to play it that way a few times and then just totally broke it down to a completely different sounding, atmospheric song. I also think that it really captures a ton of what the album is about, thematically—self-reflection and faith." Hip In Detroit- Why did you ask The ILL Itches and Haunted House to play your record release show with you? James Brown- "They’re friends of ours and just awesome bands. We think that the three of us together will be a really cool dynamic that will draw in (hopefully) a ton of people." Hip In Detroit- What are your favorite local bars, restaurants, and clubs? Why? James Brown- "I’ve always loved the Lager House; it’s a great atmosphere and always fun. I also love Green Dot; that’s some of the best food around." Hip In Detroit- What comes next now that the record is out? James Brown- "The next album is actually written, but we want to sit with the songs for a while. We’re actually thinking of putting out a mostly acoustic EP with a couple new songs and a couple songs from this album done differently. We’re all really into a lot of folk rock like the Acorn and Dawes, so that’s kind of a new thing we’d like to try out." The show starts at 9 pm on Friday and there is no cover. That's right, entry is free so you have a few extra dollars to buy the record and a few drinks while enjoying the music. The Loving Touch is located at 22634 Woodward Ave. in Ferndale. Hip In Detroit 2nd Anniversary Bash!!! Axe Ripper EP Release Show Saturday!!! Voyag3r at New Way Bar this Friday! Win Tickets to Every Time I Die!!! Win Tickets to Lucero This Weekend!!! Punk Returns to City Club!!! Win Tickets to The Business at Small's!!! Last Show Ever at Clutch Cargo's! Win Tickets to See The Dickies at Small's! GWAR at Harpo's This Friday!!! S.N.A.F.U. 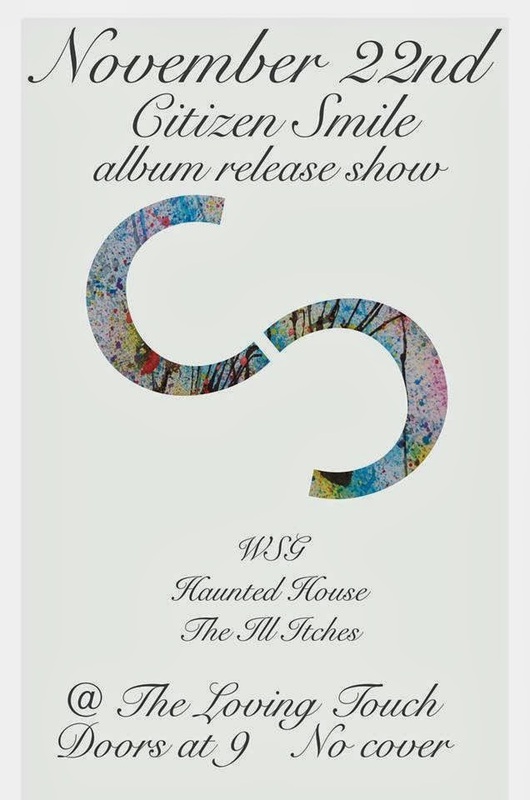 Vinyl Release Show this Friday!!! The Return of Funk Night!! !